You probably expect the “like a BMW” motto to appear frequently in this review. Because of course, when they review a luxury sports sedans that isn’t German, all automotive journalists always compare it to the latter and that’s totally acceptable, because, as we all know, the Germans have pretty much perfected the segment of high-performance luxo limousines. But that’s not what I am going to do with the 2016 Lexus GS350 F-Sport, or at the very least, I’ll try not to. Because, although Lexus does want you to trade in your 5-series M-sport for this car, it’s not bragging about how it can do this or that quicker than its Bavarian opposition. Lexus passed that torch over to the Americans and Koreans a while ago. Instead, it has decided to build the cars it wants to build. Actually, ever since the LFA supercar was introduced almost 5 years ago, not only has Lexus proven to the world that it deserves its spot within the best the world has to offer, it has made it very clear that it’s moving away from the German competition, meaning that it’s no longer building cars for the sake of numbers. 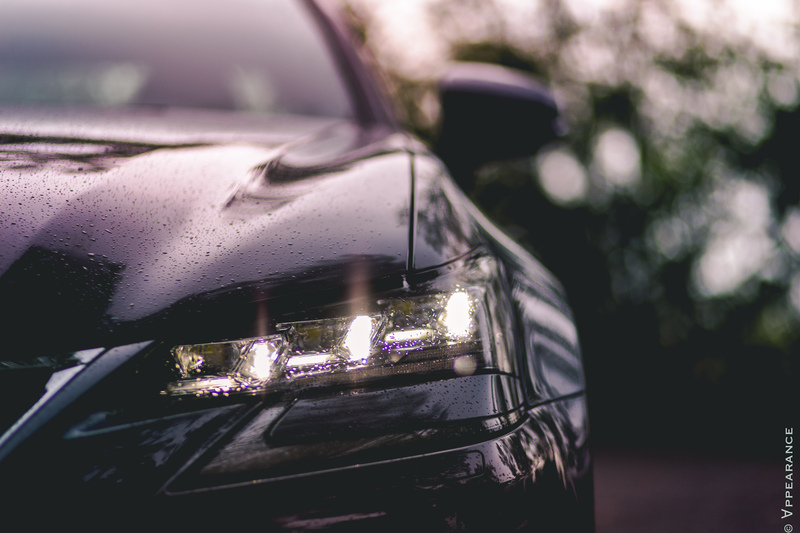 Instead, the carmaker is focusing on reinforcing its brand identity, releasing bold and innovative new vehicles, and improving its core models through incremental, yet significant mechanical changes. 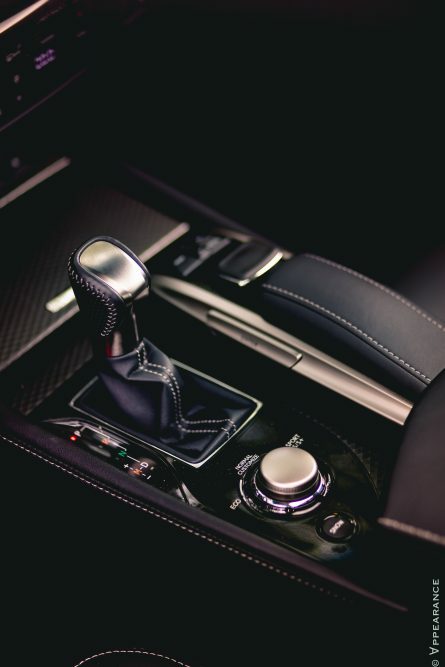 For the GS350 F-Sport, this means that even though it’s running on ageing hardware, it still manages to hold its own as a solid contender within the savage luxury sports sedan segment. 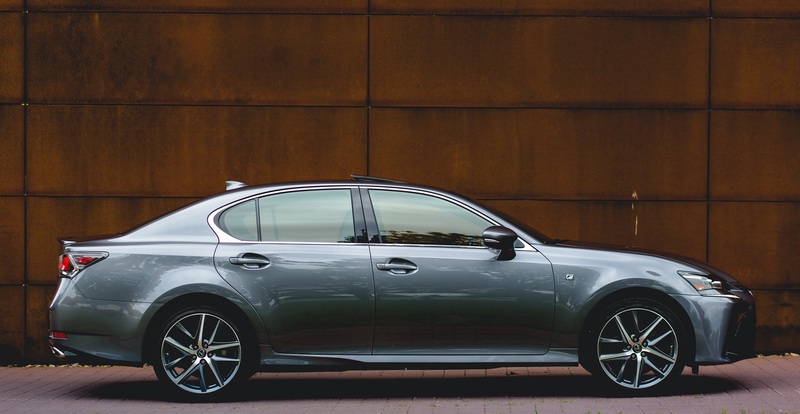 So, how different is this grey midsize Lexus compared with the other grey midsize Lexus I reviewed a month ago? Well, for starters, this one, the GS, is a lot more driver-focused than the Toyota Avalon-based ES you saw me drive in that previous review. While the ES was soft, quiet and wallowy in corners, the GS is much stiffer, reactive, and athletic. 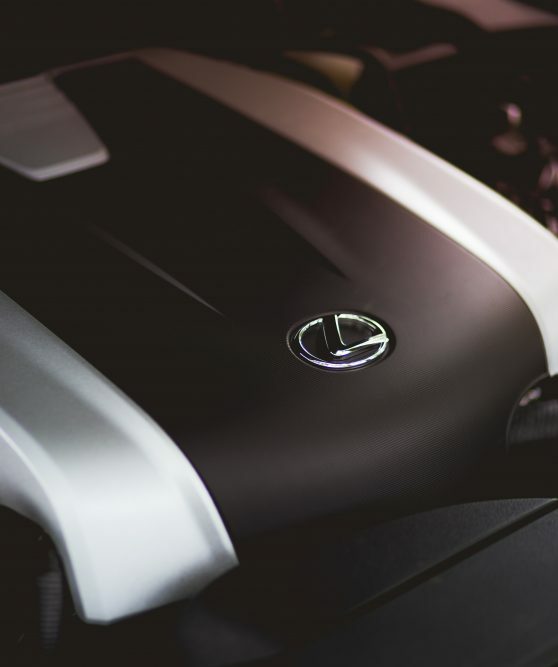 Under the hood lies the same 3.5-liter V6, essentially the one used in all V6-powered Lexus vehicles, but this time around it’s slightly retuned to develop a healthy 311-hp and 280 lb-ft of torque (versus 268/248 in the ES). 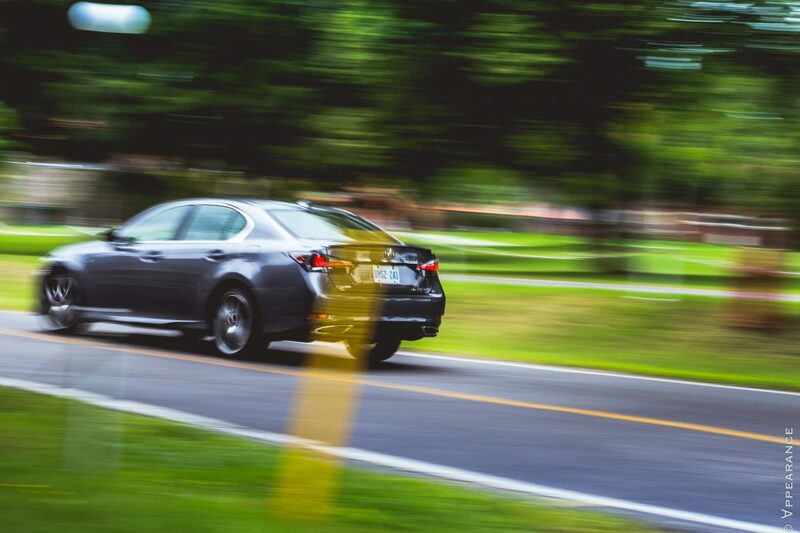 Also, unlike the ES which is a front-wheel drive car, the GS has its engine mounted longitudinally, which means it sends its power to the rear first. Ironically, only the American market gets the rear-wheel drive GS, with all-wheel drive offered as an option. Us Canucks are stuck with AWD as the sole powertrain available for non-hybrid models; which makes sense, considering our climate and road conditions. Still, I do wish we’d get the RWD GS. 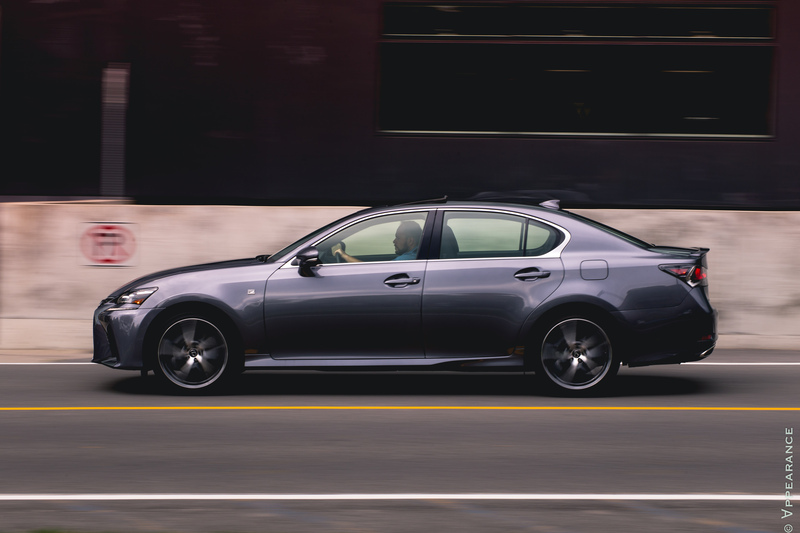 Nevertheless, it’s interesting how Lexus has split up its two midsize sedans, which both offer completely different personalities and overall character. And to be totally honest, even though the GS sells for a good $10 000 more than the ES, it’s by far my favourite car among the Lexus lineup. 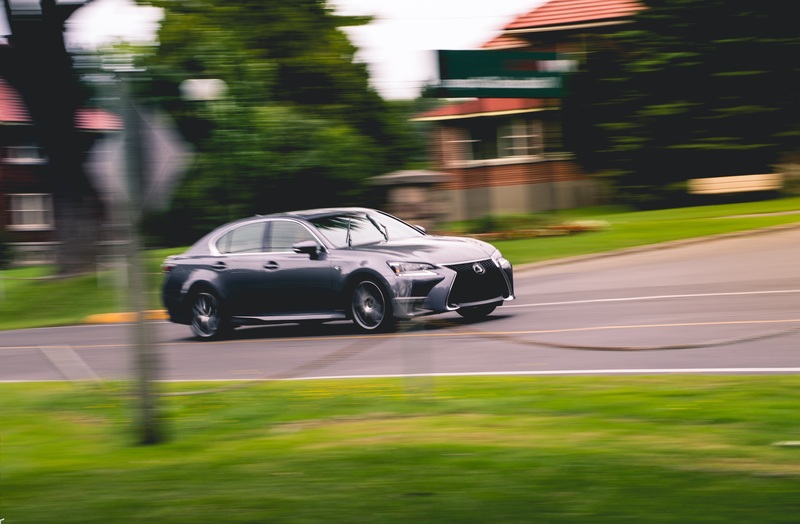 While I yearn to get behind the wheel of the almighty GS-F, Lexus’ official “M5 fighter”, I must say I was rather impressed with the “ordinary” GS’ built-in athleticism and old-school way of putting the power down. Somehow, and I know I promised I wouldn’t say this, the GS350 feels like an early 2000’s BMW 5-series to drive. Urgh – so long for being original. But then again, that’s not a bad characteristic, isn’t it? Notice how I didn’t compare the GS350’s driving feel to a new BMW? Trust me, that’s a good thing. Because although the GS may seem complicated with its futuristic headlights and gigantic LCD screen in the middle of its dashboard, there’s nothing revolutionary about how it delivers power. All competition in this segment, except maybe Acura, offer turbocharged propulsion. 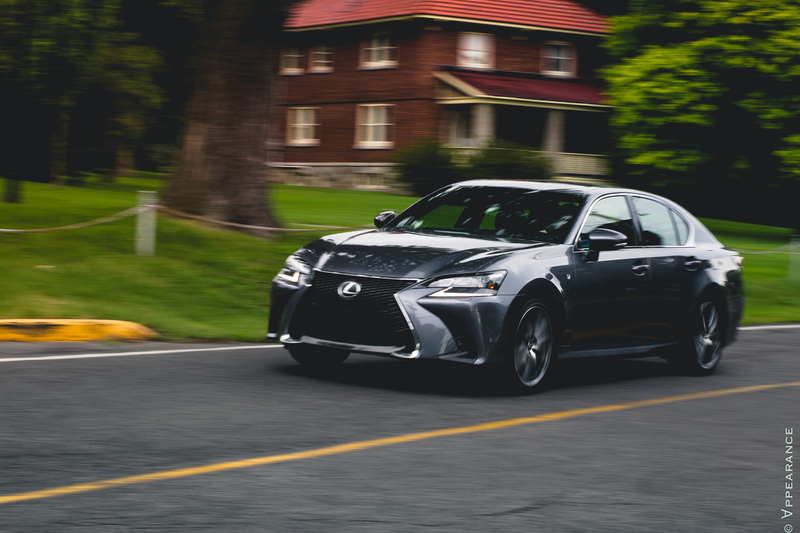 And although the American market does get a 2.0L turbo option, the GS can still be powered by an old fashion naturally aspirated V6 – something that’s becoming a rare exception in this day and age. And in the GS, that V6 loves to rev. Before I move on to explaining what the F-Sport package adds to the GS’s overall performance, I must say it does a fantastic job of accentuating the car’s already bold styling. Love it or hate it, Lexus’ new “the Predator’s face” corporate design language is truly growing on me – especially on the GS. Perhaps it’s because the GS is a rather big car, one with a wide stance and overall massive appearance on the road that makes this face that only a mother could love fit beautifully on its chassis. F-Sport adds darkened headlights and LEDs, a more aggressive front fascia (as if the base one wasn’t aggressive enough), seriously stunning 19-inch wheels on staggered tires, a rear diffuser, darkened tail lights and a subtle, yet distinctive decklid spoiler. It’s all very well executed and business-like. 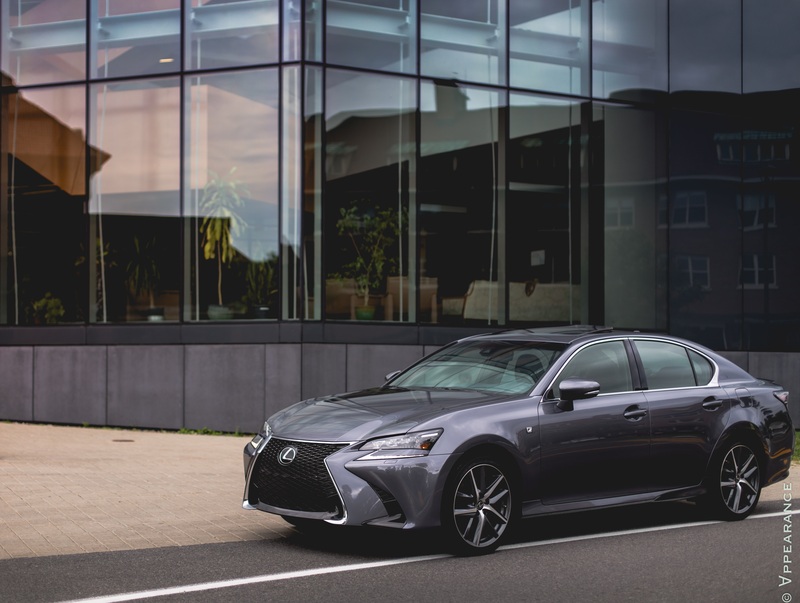 Add to that Lexus’ traditional superior build quality, and an all-out sublime Nebular Grey Pearl paint finish, and the GS350 F-sport comes through as a truly stunning machine. Most importantly, the GS doesn’t look like it’s trying to mimic the competition, but is rather a distinctive product on its own. And unlike the ES which looks like a pimped-up Toyota, the GS is all Lexus. Mechanically, the F-Sport package adds adaptive variable suspension and 14.0-inch-diameter two-piece front rotors, as well as four-piston brake calipers – a solid piece of hardware that really shows dividends after pushing this massive sedan hard and commanding it to slow down, serving constant pedal feel throughout the entire experience. That said, even with the added performance hardware, in order to best exploit this Lexus’ otherwise calm and sedated personality, one must select Sport + mode on the centre console selector; a setting which stiffens up steering feel, improves throttle response, and makes the 6-speed automatic transmission more aggressive in its shift patterns, especially when set to M mode, where gears can be manually shifted using the steering wheel-mounted paddle shifters. It took me a while to discover the GS’s hidden performance. 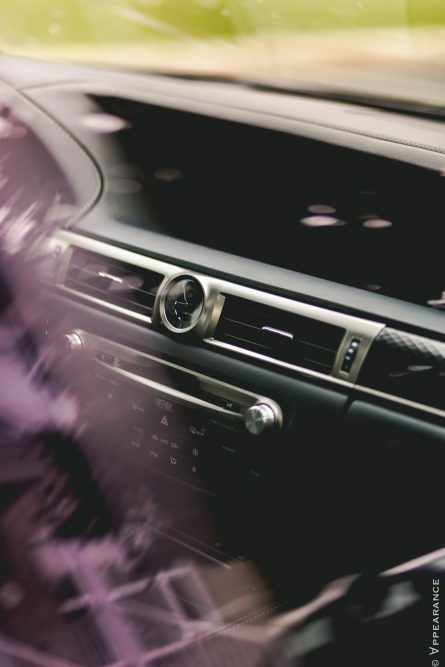 By default, when the car is in Normal or Eco modes, the GS doesn’t feel much different than the ES; meaning it envelops you in massive comfort, luxury, and serenity, but never really excites your senses. Furthermore, that 3.5L V6, although plenty capable of moving this 1764-kg AWD luxury barge around with ease around traffic, lacks the low-end grunt required to really make an impression when gunning the throttle. In other words, to fully appreciate the GS350’s performance, you have to grab it by the scruff of the neck and rev the snot out of it. And that’s really where that 3.5L starts to shine, because nothing can emulate the instant throttle response of a naturally aspirated engine, especially one that loves to rev like this one. Although a bit low on low-end twist, the 3.5L remains smooth throughout its entire rev range and emits a solid intake bark as it approaches its 7000 rpm redline. In the twisties, you do feel the GS’ weight, yet it won’t mind being pushed around, remaining confidently planted to the ground, delivering satisfying steering feedback, very minimal body roll considering its size, and an overall stiff, responsive, and solid chassis that manages to remain compliant over rough surfaces. That said, is the GS a deeply involved performance sedan? Not quite. It’s impressive, but leans more towards Acura TLX dynamics rather than those of an Audi A6. The GS won’t set any lap records or new performance benchmarks, but it won’t do you shame either, and the driver involvement isn’t too subdued to make this a boring ride. Balance is the key here – where the Lexus shines is in its overall blend of luxury, sophistication, and performance. And even though we all know that this V6 is understressed and could easily pump out 350hp or more, you just know that it’ll continue pulling strong 400 000 km down the line. 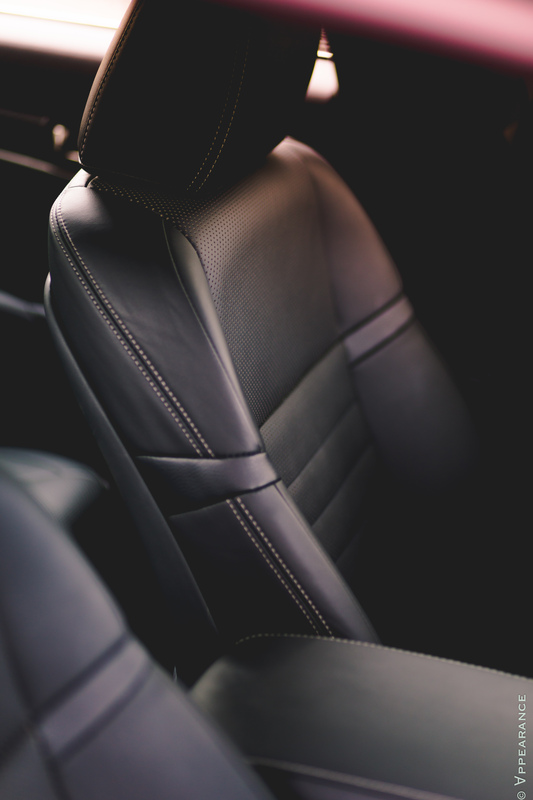 Inside, the GS is the usual blend of soft-touch materials, undeniable comfort, high-quality leather, and fanatical attention to detail. F-Sport adds a 16-way adjustable driver’s seat – a gem for any body shape, but although the quality of the leather is up there, it falls a little short of what the (not them again) Germans will offer in this price range. And that’s kind of where you start questioning the GS’ relevance in the segment. Since it’s priced in the same territory as a BMW 5-Series, Audi A6, and Mercedes-Benz E Class, I’m afraid to say that the Lexus’ material quality feels mediocre against its German opposition. Actually, to the GS’ credit, it’s riding on what is already becoming an ageing platform, which means it does what it can with what it has. Also, maybe this has to do with the fact that my tester was fitted with an all-black interior and carbon fibre trim, but the overall feel of the cabin felt a lot more spartan and cavernous than the elegant and airy two-tone living room passenger compartment of the ES. There’s no denying this Lexus’ high levels of comfort and sophistication though. It’s sweating through every single one of its pores, something that can only be experienced in the flesh. 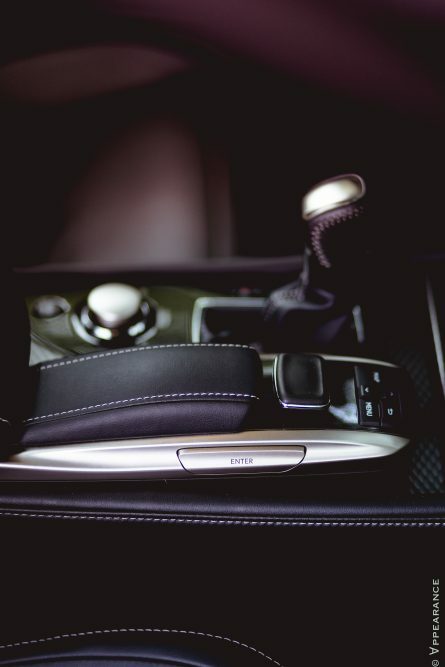 Ergonomics-wise, although I’m not one who will complain about the brand’s Remote Touch Interface, I’m not so convinced about some of the GS’ standard controls, such as the wiper and blinker stalks. 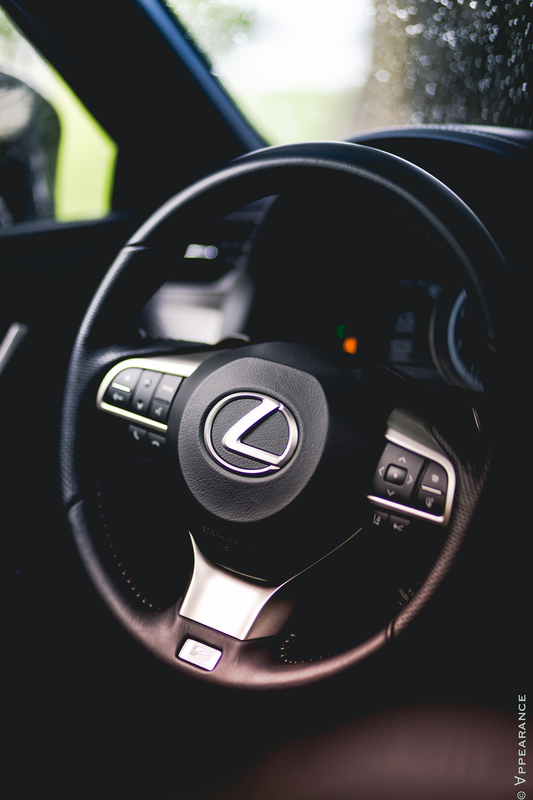 In a quest to reinvent the wheel, Lexus has transformed them into confusing and unintuitive devices that summon more frustration to the driver than they should. Pricing for a GS350 ranges from $58 990 all the way to $77 940 for a the hybrid GS450H. Yikes! My tester, with the added F-Sport package, sells for $71 690 – Jezas. In comparison, an Audi A6 with the S-line Competition Package sells for $77 650, while a BMW 535 Xi with the M performance package sells for $76 352 – making the Lexus seem like some sort of a bargain. 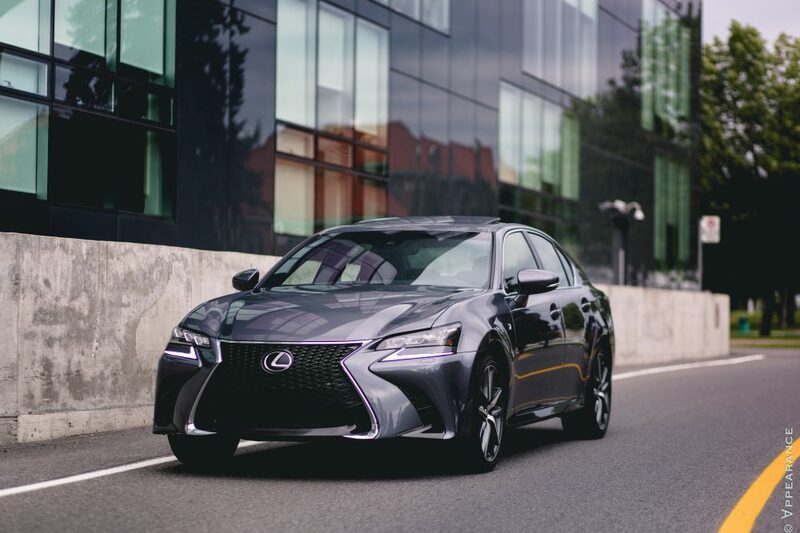 So, although the 2016 Lexus GS350 F-Sport may not yet be the hair-rising performance sedan Lexus would like you to believe, that F-Sport package adds just enough athleticism to allow the GS to hang with the best driver-oriented luxury sedans on the market without breaking a sweat. 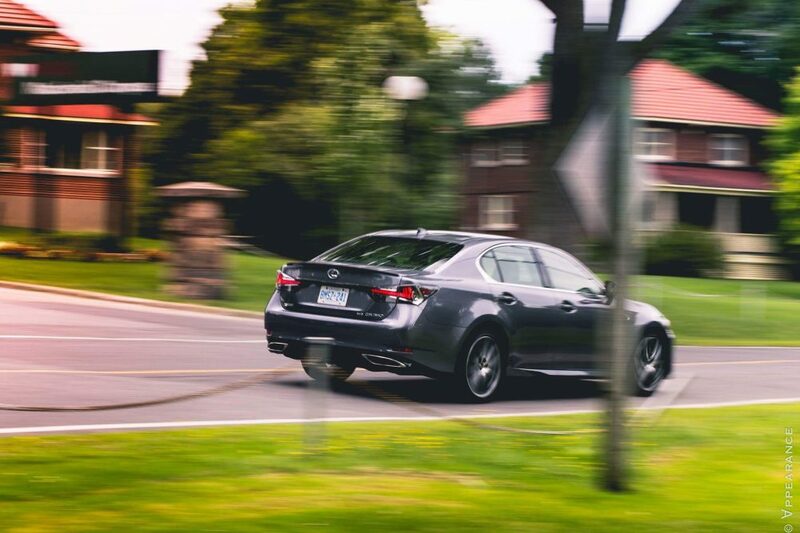 Remember, Lexus’ tour de force is its world-class reliability and obsessive attention to detail, and on that front, the GS has its European competition completely pulverized. That being said, at the end of my week spent in the GS350 F-Sport, I must confess I was left with an overall lukewarm feeling. I can’t say I disliked this car, it’s an impressive machine, and it’s very hard in writing to express how well this car drives. It’s supple in all the right ways. But unfortunately, it somehow doesn’t leave a strong enough impression to consider it over anything German, or even American in this price range. But maybe that’s because I had my sights set on the Solar Flare-painted GS-F parked next to it in the Lexus press car garage. + Bold and stunning exterior design. + Fanatical attention to detail and superior build quality. + Enough performance credentials to have fun on a winding road. – Questionable ergonomics of basic controls. – Not as refined or focused as European competition. – Platform is showing its age.